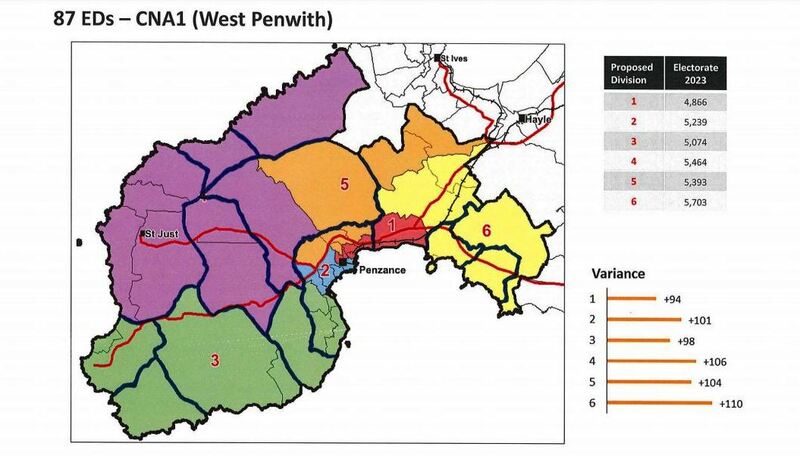 The maps reproduced in this article illustrate the first draft of how officials suggest re-drawing Cornwall Council boundaries. 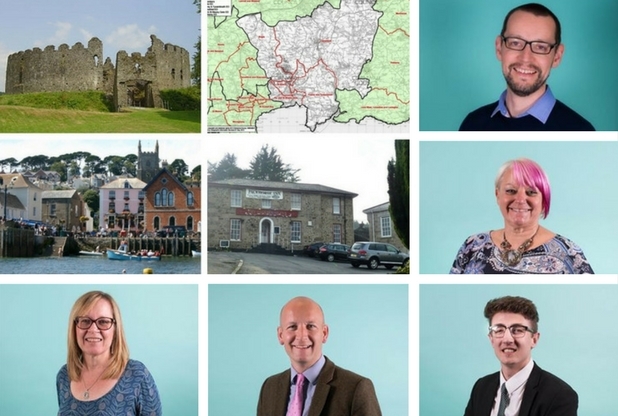 The 2021 local council elections will be fought on only 87 divisions – sweeping away 36 councillors without a vote being cast. 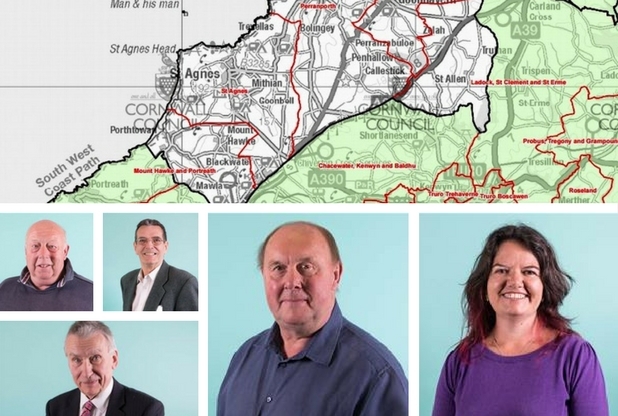 The maps, now published on the Cornwall Council website, contribute to a public consultation exercise conducted by the Local Government Boundary Commission, which will have the final say. 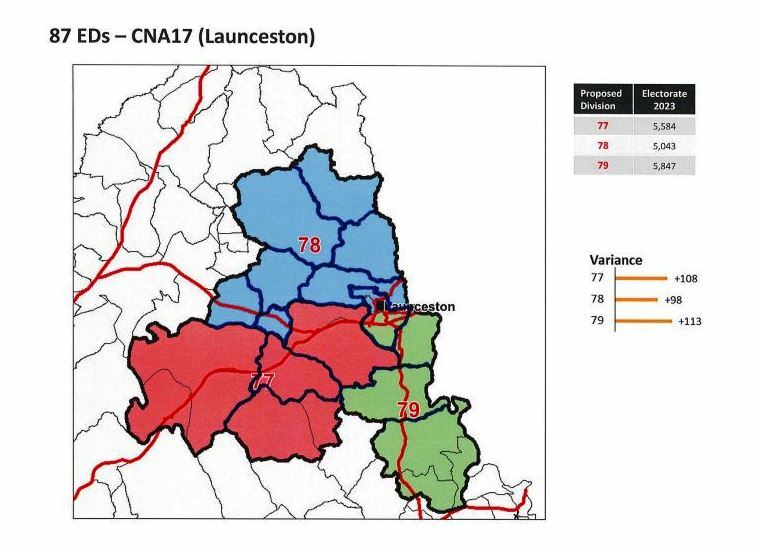 Its main concern is that each councillor should be “worth” roughly the same number of votes. 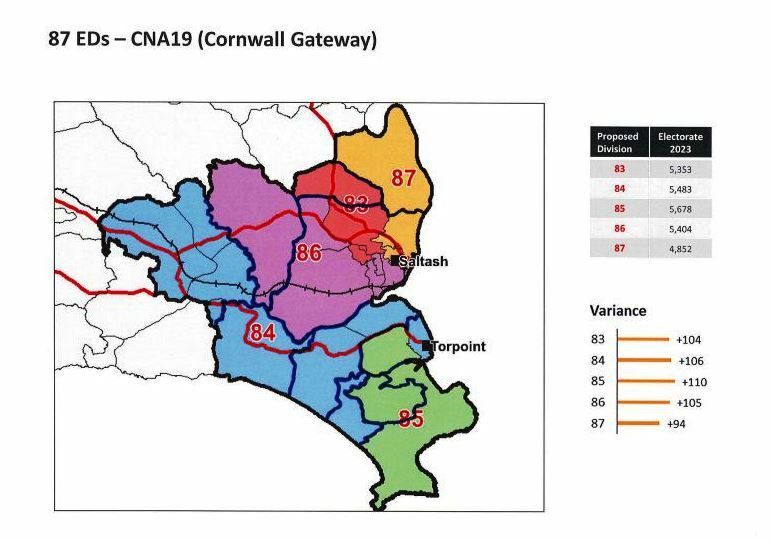 The mapping exercise is based, mainly, on Cornwall Council’s Community Network Areas (CNAs) and confirms analysis published by Cornwall Reports in July as to which councillors are most at risk, and where. 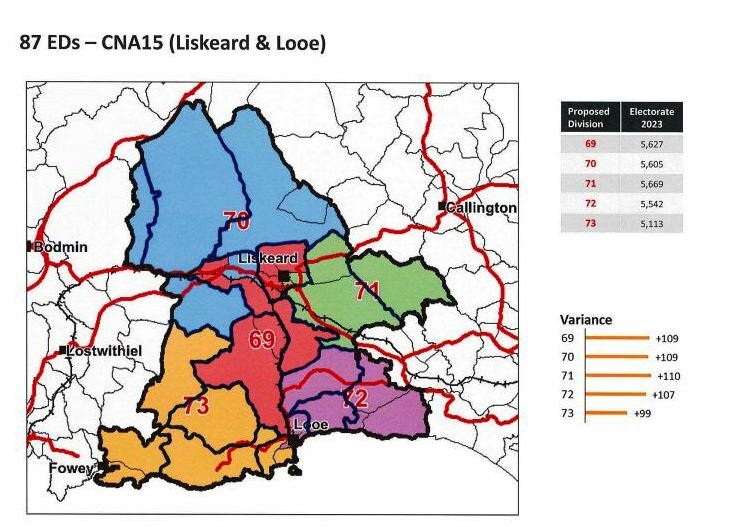 The reduction in council seats could pose particular problems for Independent members. 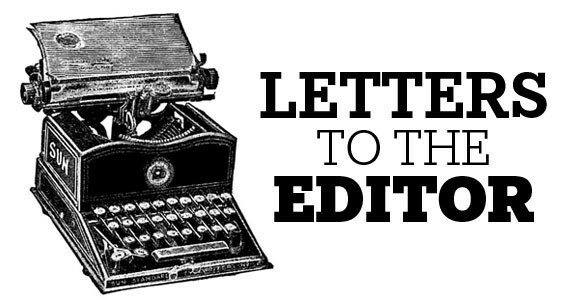 Without a party political machine to harvest postal votes, they could struggle to survive in larger wards where any personal appeal they might have would be less effective. 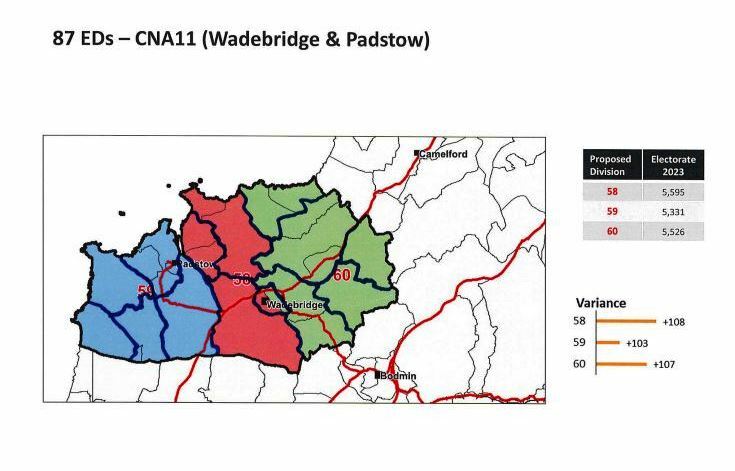 Because existing ward boundaries do not fit neatly into CNAs, some sitting councillors are in more than one area. But whether this makes them even more at risk, or gives them a greater chance of survival, might depend on their chances of selection as a candidate by a political party. 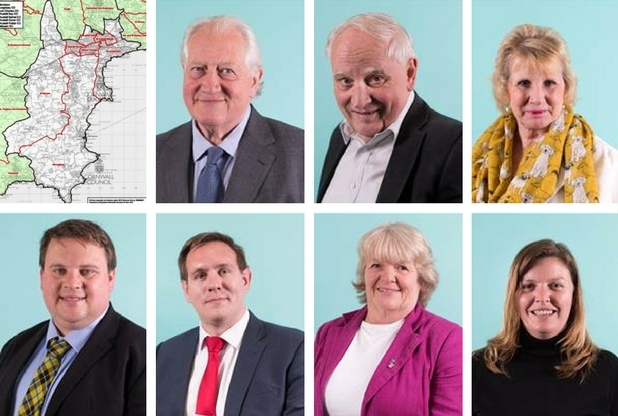 Several councillors have hinted that they might retire, rather than fight an election in a ward which they know they cannot win. 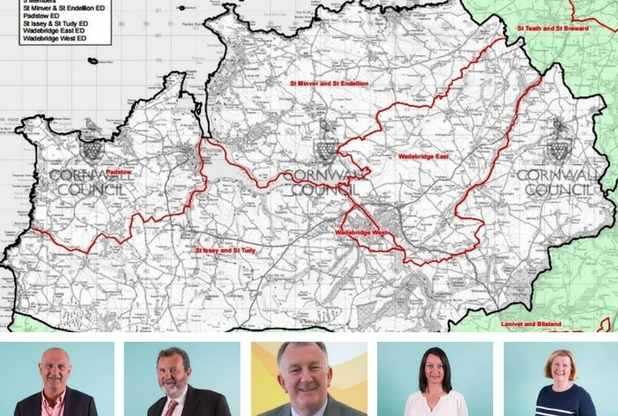 Some existing wards in the North and East of Cornwall, currently held by Liberal Democrats, look much more challenging under the proposed new boundaries. 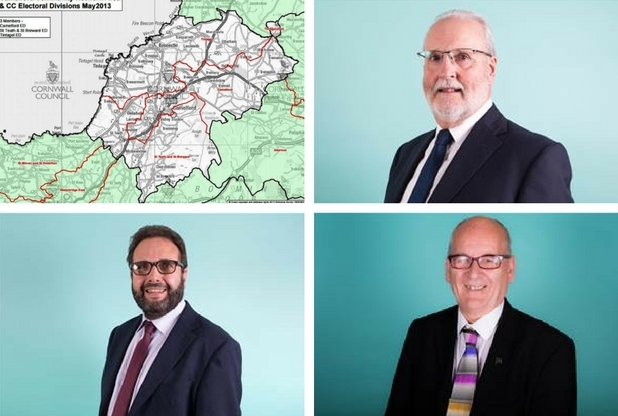 In a letter to every councillor, officials say: “These are not intended to represent the end state and they are presented only as a starting point. 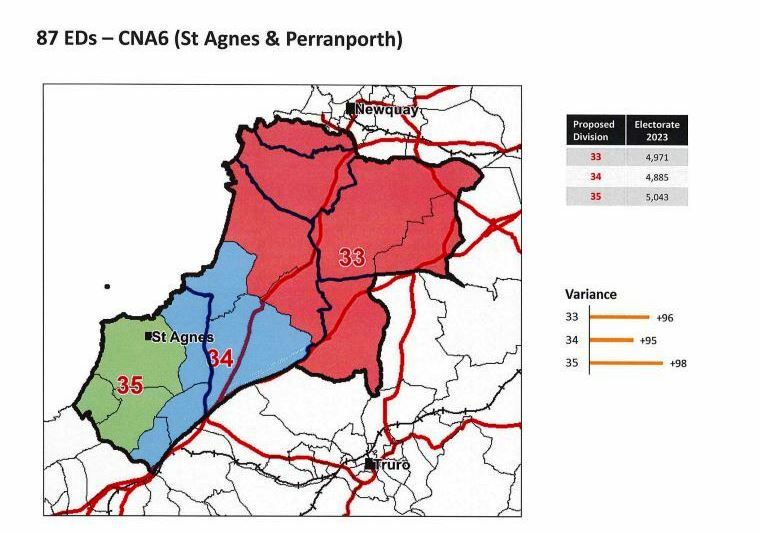 There are issues that have been identified that need to be resolved during the discussions that will take place over the coming weeks and months, such as the target electorate tolerance being exceeded in a few areas, crossing of parish boundaries that might not be desirable and groupings of polling districts which may not be quite right. 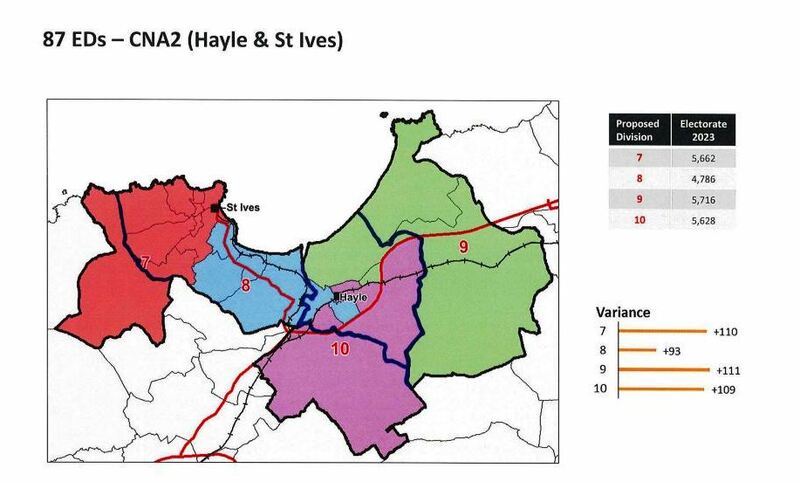 The LGBC Commission will run two planned consultations on division patterns. The first is now live and runs until 19th February 2018. 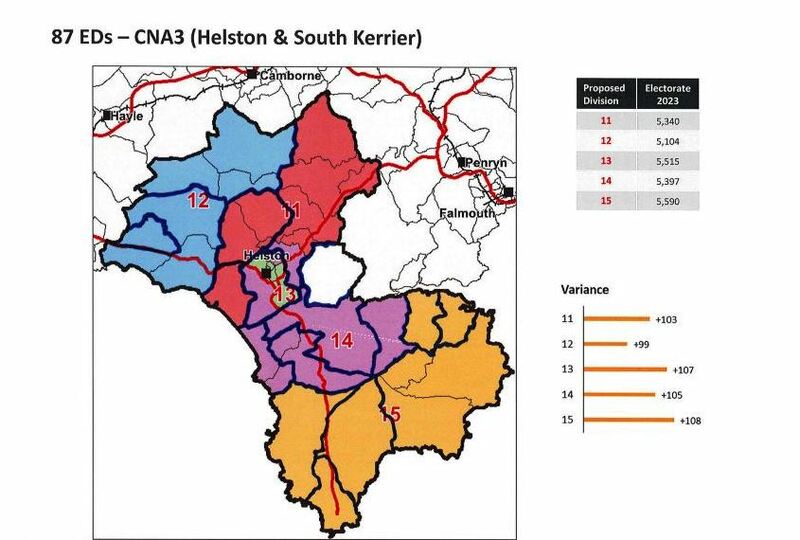 During the first consultation period the council and others have the opportunity to submit their own division proposals. The second consultation period is scheduled to run from 8th May to 16th July 2018 and that will be on the Commission’s own division proposals which they are due to publish at the beginning of that period. 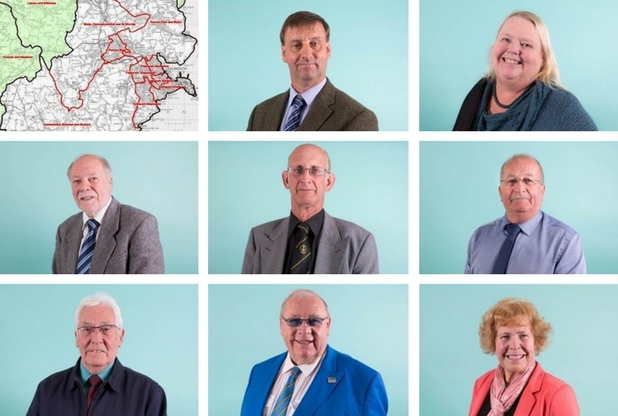 To deliver electoral equality where each councillor represents roughly the same number of electors as others across the Council. The Commission has said: “The Commission will test proposals against the criteria before drawing up draft recommendations. Accordingly, all proposals should demonstrate how they meet the three requirements. The Commission will take decisions based on the strength of the evidence presented to it and not merely on assertion. 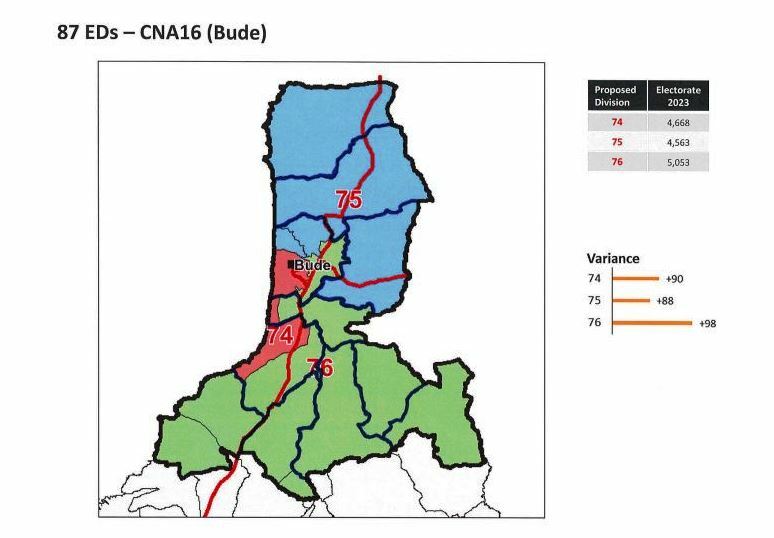 For example, details of community interests such as the location and use made of local facilities, services and local organisations demonstrating how a community manifests itself will carry greater weight than submissions that simply assert that an area has community identity." 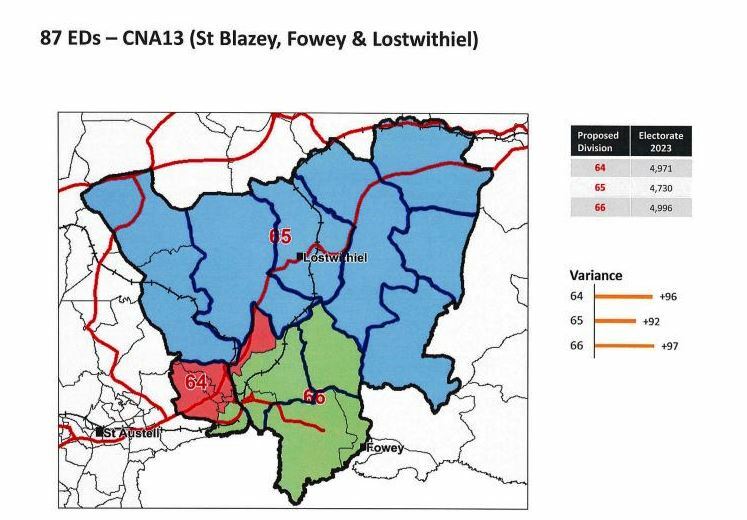 The Commission’s Technical guidance and guidance on How to propose a pattern of wards is available on their website. 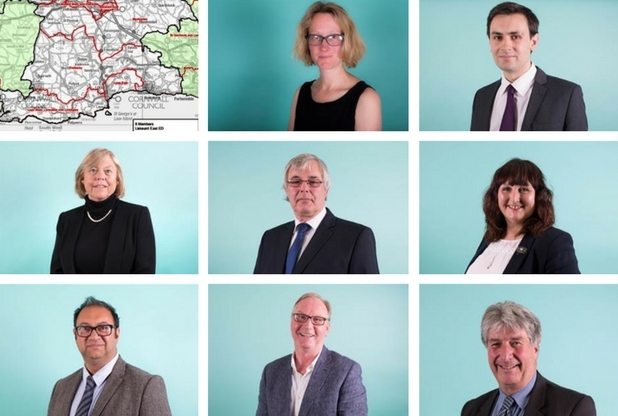 Although all proposals should be submitted direct to the Commission, the council’s Electoral Review Panel is keen to understand what consultation responses are being submitted and to receive comments from local councils, the public and other stakeholders on how the new electoral divisions should be formed. 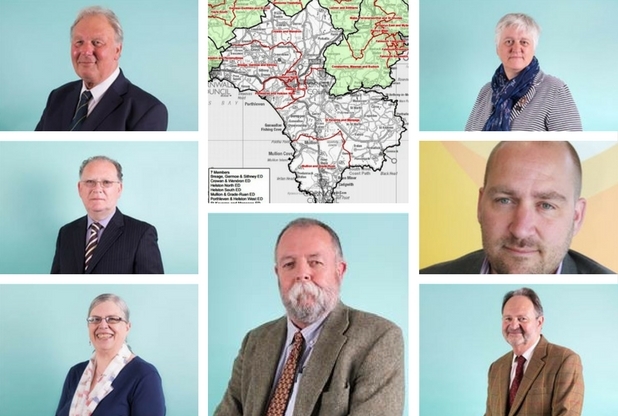 Readers can submit their comments direct to the Council at electoralreview2018@cornwall.gov.uk. 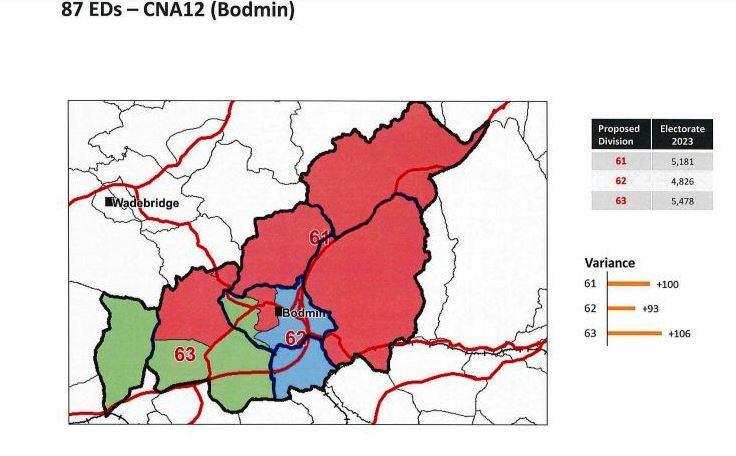 Bodmin faces a 25% cut, from four to three. From top: Pat Rogerson, Jacquie Gammon, Chris Batters. No picture of Leigh Frost. 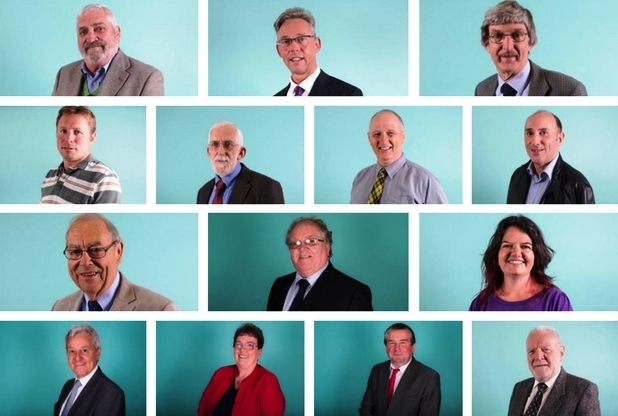 L-R from top: John Herd, Paul White, Jeff Collins, David Atherfold, David Biggs, Mark Kaczmarek, Robert Hendry, David Ekinsmyth, John Thomas, Joyce Duffin, Philip Desmonde, Barbara Ellenbroek, Stephen Barnes and Ian Thomas. 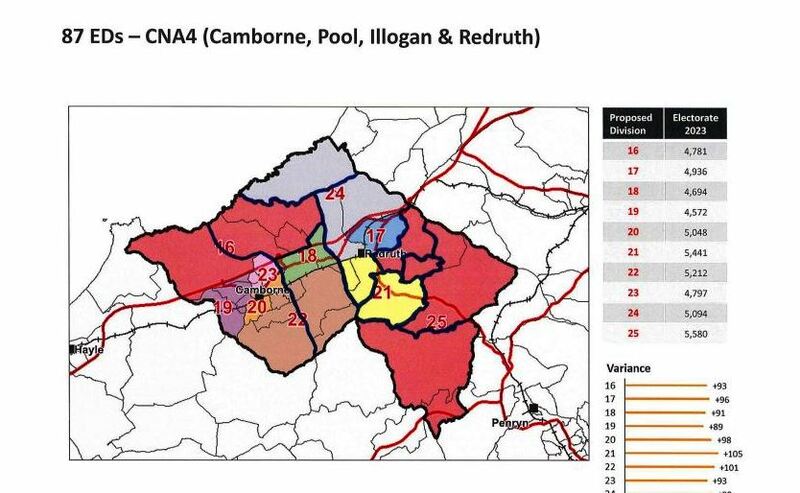 This large CNA would lose four of its councillors. Clockwise from top: Rob Rotchell, Barry Jordan and Dominic Fairman. A 33% cut in this CNA means one of them would have to go. Clockwise from top: Dorothy Kirk, Jesse Foot, Sharon Daw, Jim Flashman and Andrew Long. Two will have to go. L-R: John Pollard, Andrew Mitchell, Graham Coad, Linda Taylor, Col Richard Robinson and Lionel Pascoe. 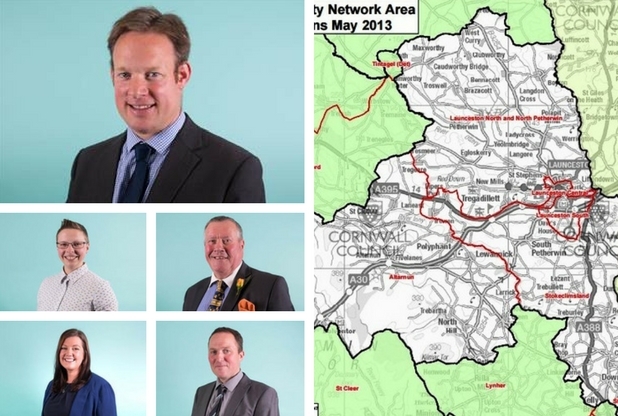 A 33% cut means two of them will have to go. 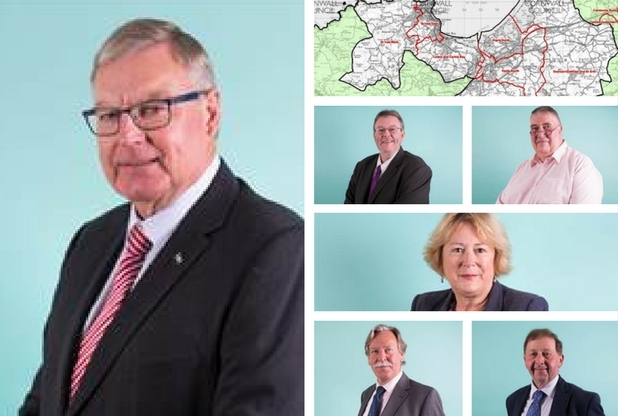 Clockwise from top: Tom French, Malcolm Brown, Jackie Bull, Cherilyn Williams, Sandra Heyward, Richard Pears and James Mustoe. 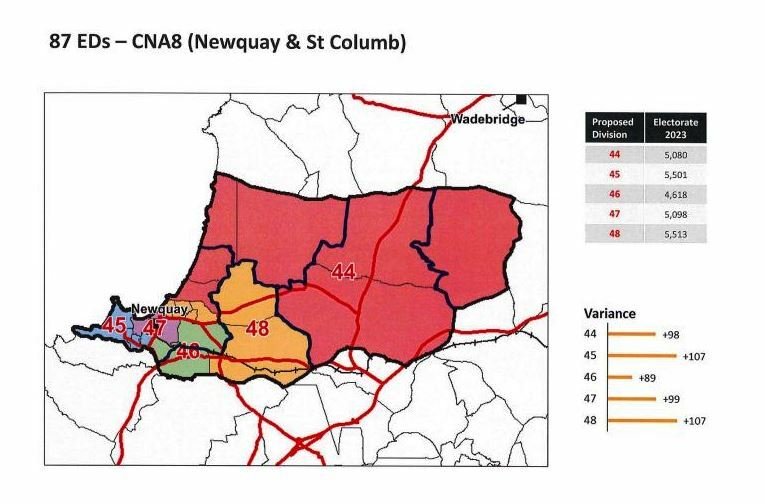 The proposed 29% cut is average for Cornwall and would mean the loss of two councillors. 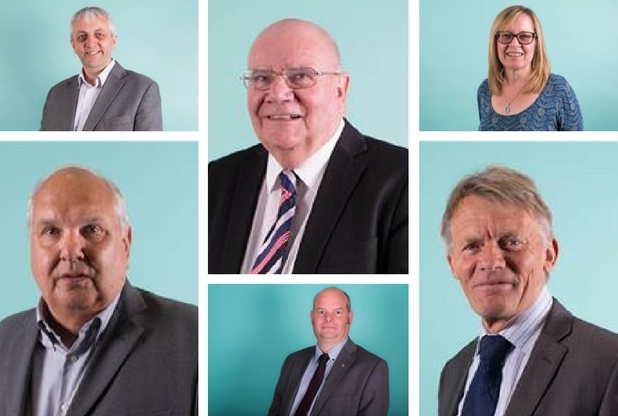 L-R from top: Dulcie Tudor, Bob Egerton, Julian German, Rob Nolan, Loic Rich, David Harris, Bert Biscoe, Mike Eathorne-Gibbons, Martyn Alvey and (r) John Dyer. Eight of these should survive the cull. 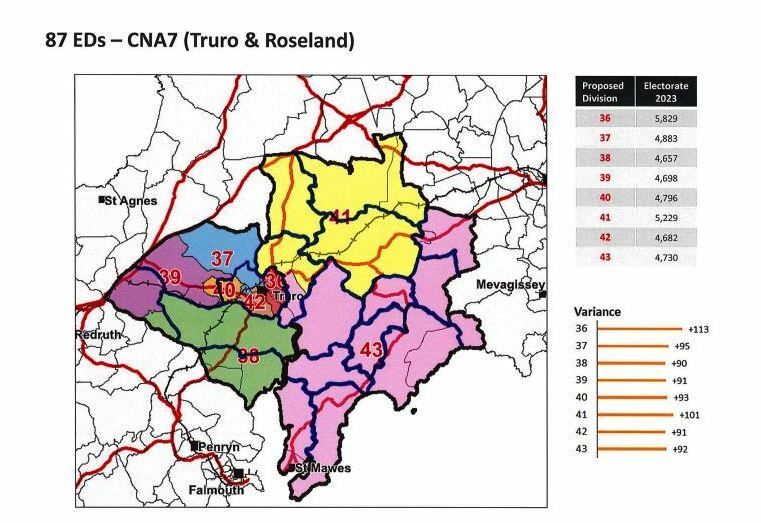 The Falmouth & Penryn CNA needs only a 22% cut - compared with a 29% Cornwall average - and so seven of these should survive. 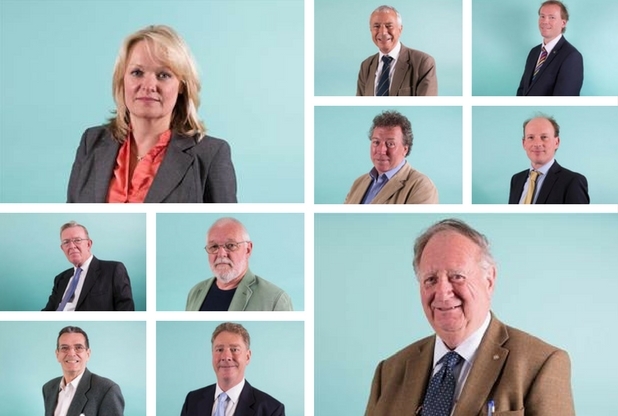 L-R from top: Alan Jewell, Candy Atherton, John Bastin, David Saunby, John Symons, Geoffrey Evans, Peter Williams, Mary May and Mathew McCarthy (no picture). 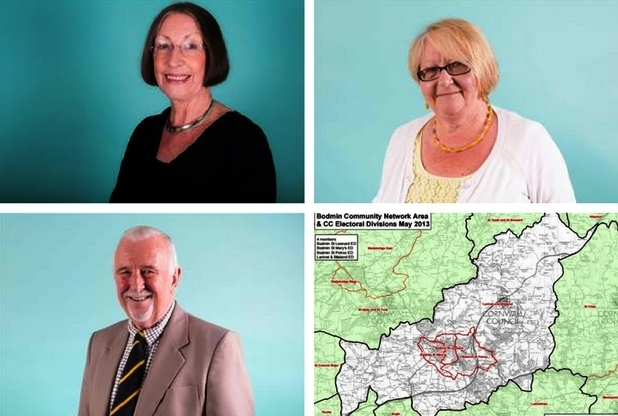 This CNA faces a 37% reduction in councillor numbers, so three of these face the chop. 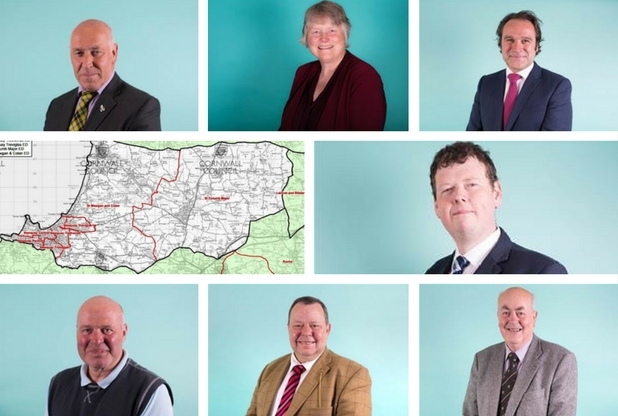 L-R from top: John Crago, George Trubody, Derek Holley, Sheila Lennox-Boyd, Hilary Frank, Sam Tamlin, Jesse Foot and Gary Davis. 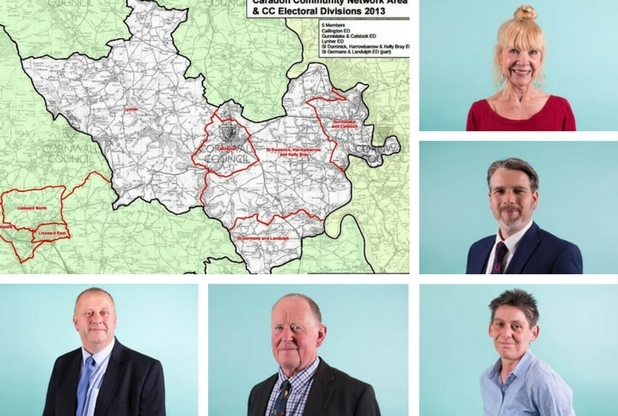 Clockwise from top: John Keeling, Loveday Jenkin, Andrew Wallis, Julian Rand, John Martin, Carolyn Rule and Mike Thomas. 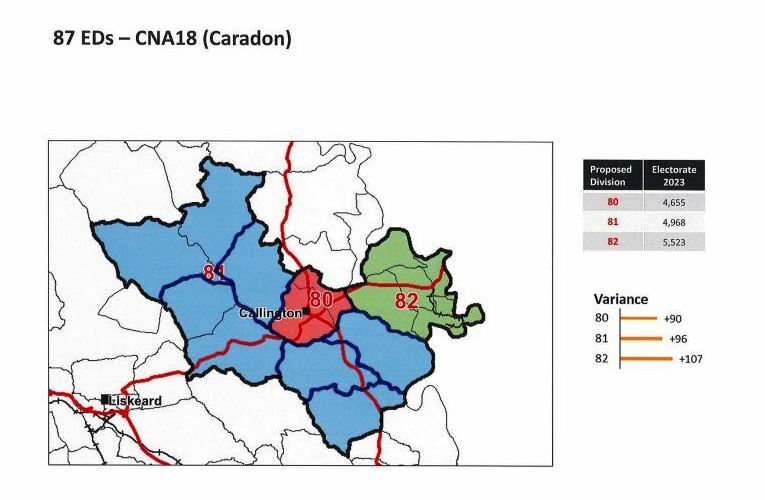 A 29% cut would mean the loss of two councillors from this CNA. 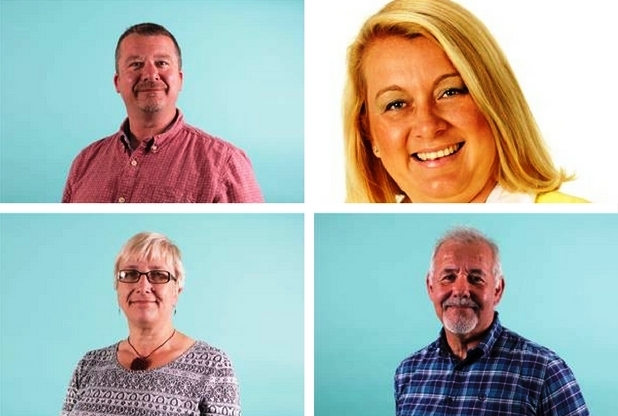 From top: Adam Paynter, Jade Farrington, Neil Burden, Gemma Massey and Adrian Parsons. Two of these will have to go. 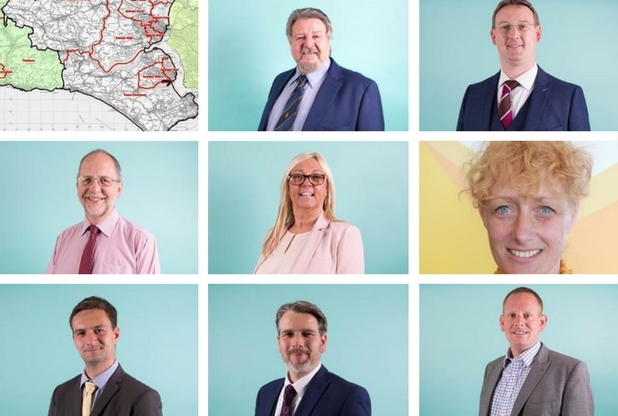 Clockwise from top: Geoff Brown, Joanna Kenny, Olly Monk, Kevin Towill, John Fitter, Paul Wills and Paul Summers. 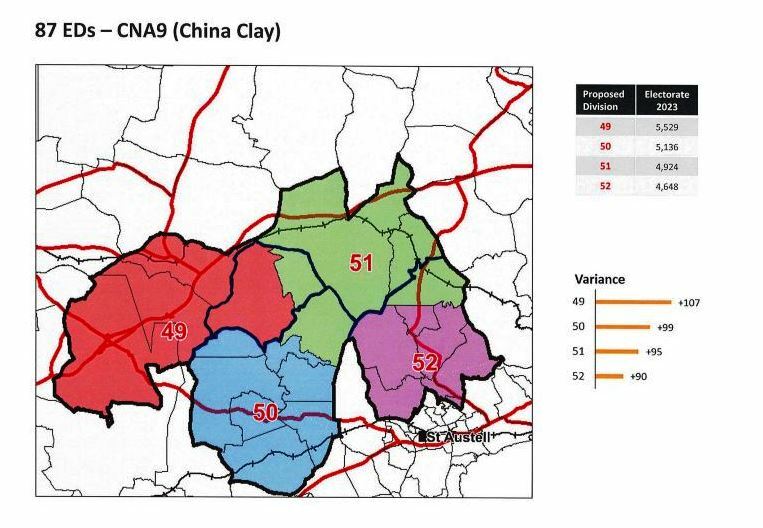 A 28% cut in this CNA allocation means two of them will have to go. 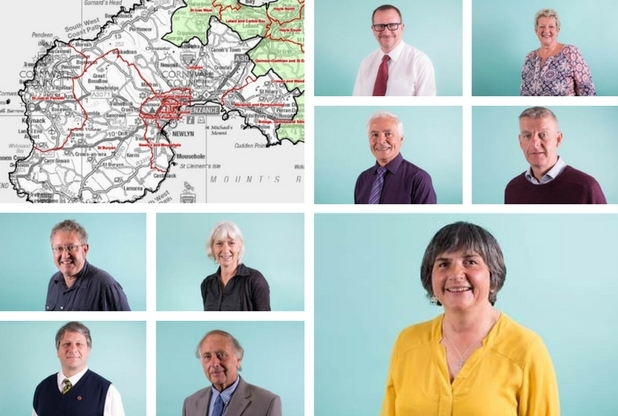 L-R from top: Tim Dwelly, Sue Nicholas, Mario Fonk, Jim McKenna, Cornelius Olivier, Helen Hawkins, Simon Elliott, Roger Harding and (r) Sue James. A 33% cut in this CNA means three of these would be abolished.